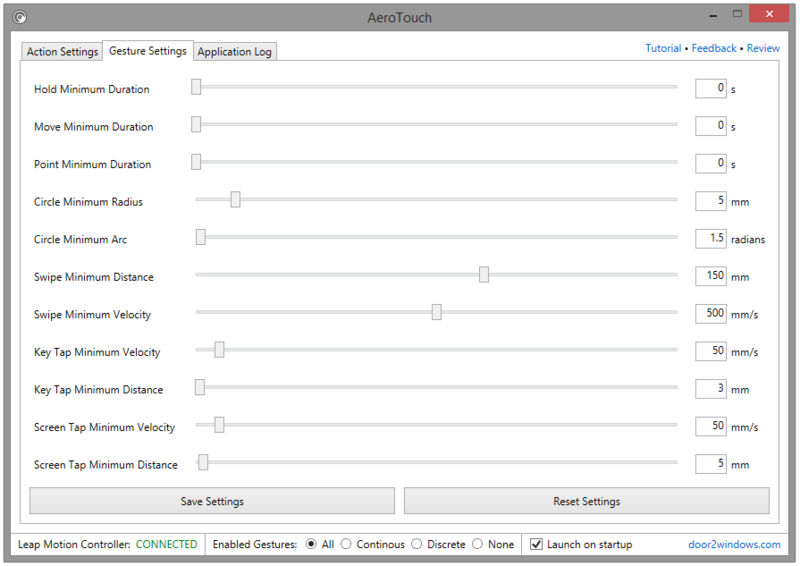 AeroTouch is an app for the Leap Motion™ Controller which lets you easily configure different gestures to perform any action for any app. For example, a swipe up gesture can maximize the active window while a swipe down can minimize it. A swipe left gesture can snap the active window to the left side of your screen and similarly a swipe right gesture can snap it to the right side. AeroTouch gives you endless possibilities, you can configure it to your liking to play a game or do any task with simple hand gestures. 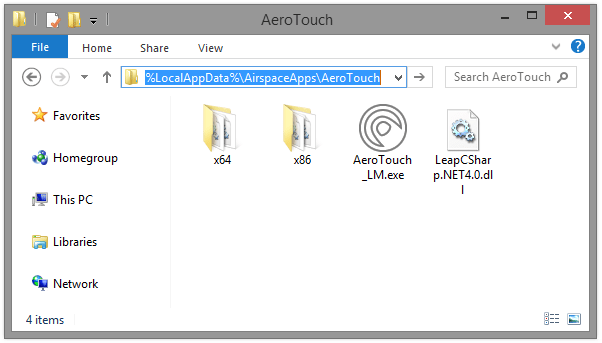 Connect the Leap Motion Controller and start the app from Airspace™ Home. If you have run the app for the first time, it will ask you to view this tutorial. The app window will open. 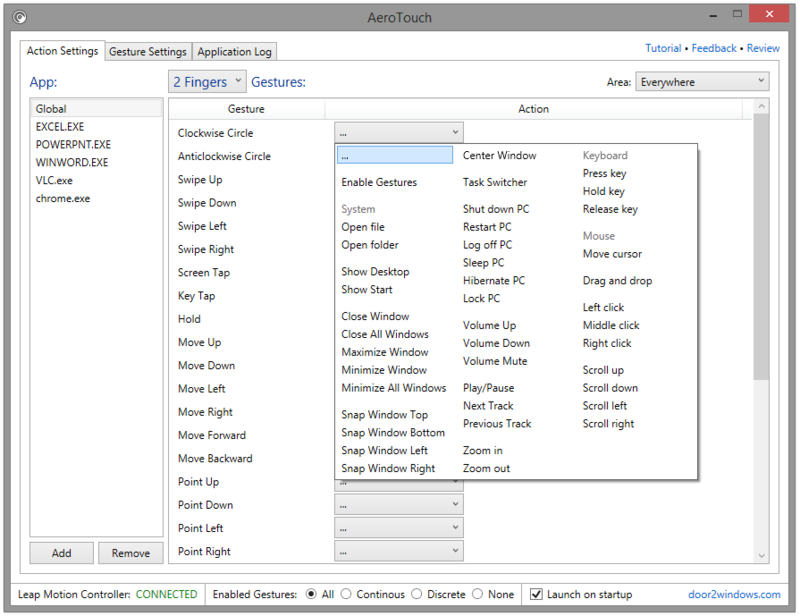 In the left pane, select the app for which you want to configure the settings. The Global option will perform the actions for every app whose settings are not manually set. To set manual settings for an app, click the Add button, locate the app and select it. To remove an app and all its settings, select the app in the left pane and click the Remove button. If you click the Remove button when the Global option is selected, all the settings of the Global option will be reset. Hold — triggered continuously when any finger/tool is visible. Point — triggered continuously when any finger/tool points at a specific direction. Move — triggered continuously when any finger/tool moves in a specific direction. Circle — triggered when any finger/tool completes tracing a circle. Swipe — triggered when any finger/tool moves in a linear direction. Key Tap — triggered when any finger/tool makes a tapping movement like tapping a keyboard key. Screen Tap — triggered when any finger/tool makes a tapping movement like tapping a vertical computer screen. 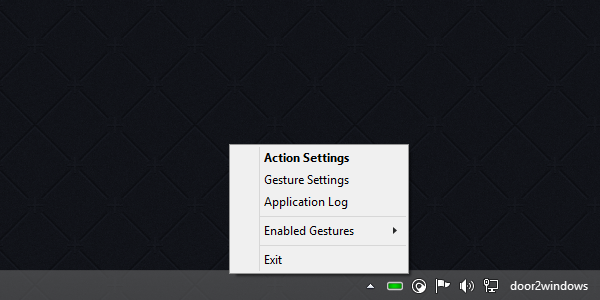 Enable Gestures — Select the gestures which you want to be enabled when the gesture is triggered. 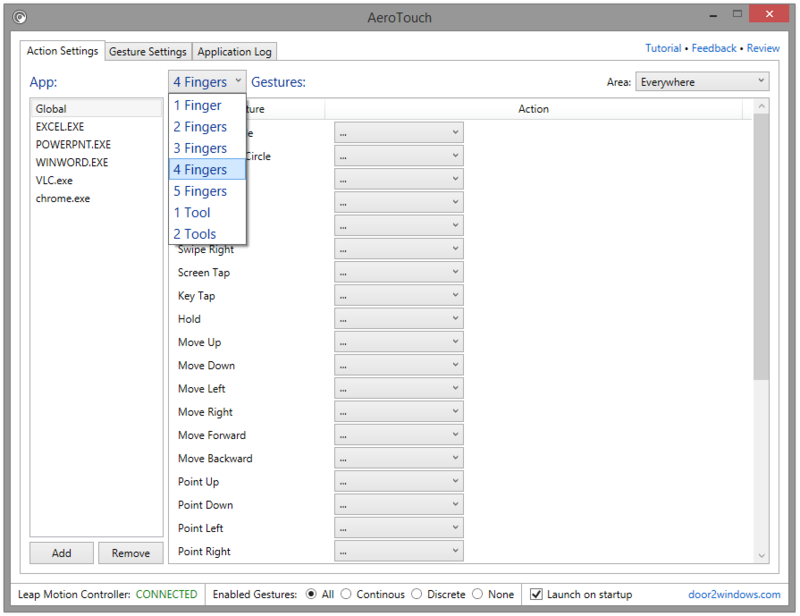 Hold, Point and Move are continuous gestures while Swipe, Key Tap and Screen Tap are discrete gestures. 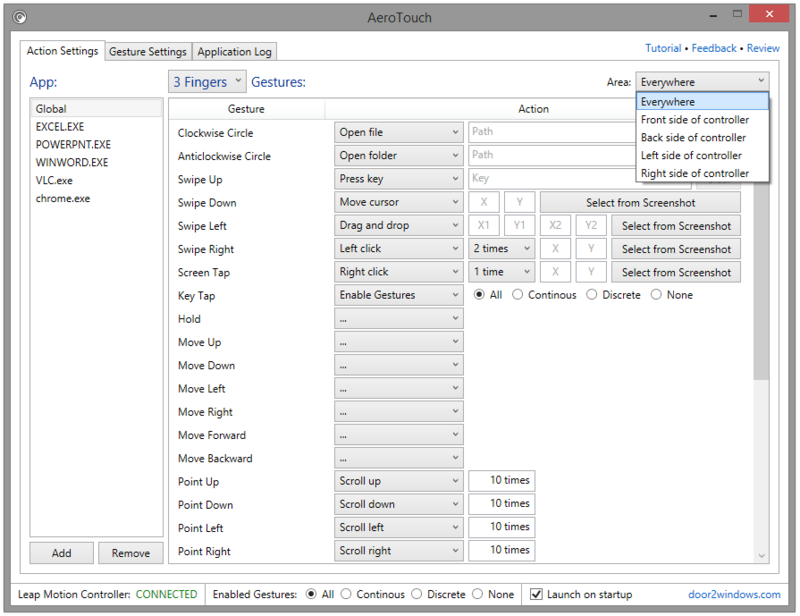 Open file — Click the Browse button and select the file that you want the app to open when the gesture is triggered. Open folder — Click the Browse button and select the folder that you want the app to open when the gesture is triggered. Press key — Click the Key text box and type the keys that you want the app to hold and release. Hold key — Click the Key text box and type the keys that you want the app to keep holding. Release key — Click the Key text box and type the keys that you want the app to release. If the keys are not being hold by the app previously, this action will have no effect. Move cursor — Set the X and Y coordinates of the mouse cursor. You can also specify + & - in the coordinates which will add or subtract the coordinates you specified with the current mouse coordinates. Drag and drop — Set X1 and Y1 to the coordinates where you want the drag action to start and X2 and Y2 to the coordinates where you want the drag action to stop (drop). Left/Middle/Right click — Set the X and Y coordinates of the mouse cursor. If you leave the X and Y values blank, the app will click on the current X and Y coordinates of the mouse cursor. Scroll up/down/left/right — Set the no. of times you want the mouse wheel to be scrolled. 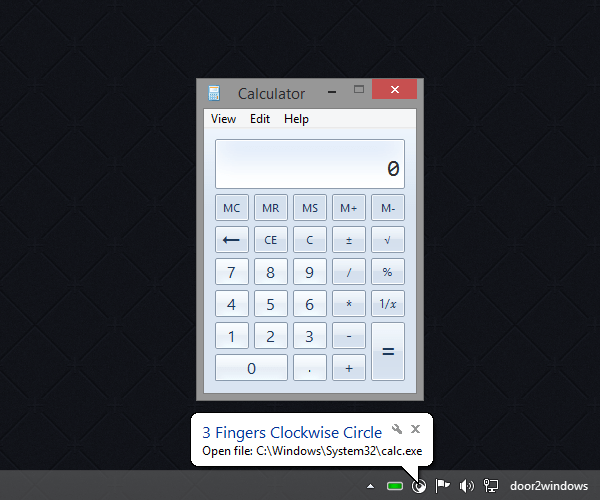 Check the Launch on startup option so that the app automatically starts when your PC starts. 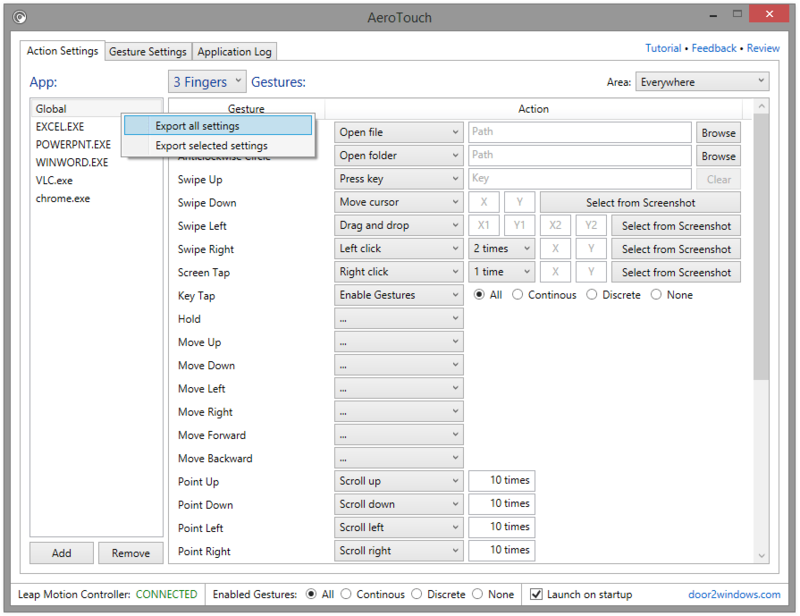 If you want to save the settings, right-click on the left pane and select Export all settings to export the settings of every app or Export selected settings to export the settings of the selected app. To import the saved settings, open the saved file and click Yes.